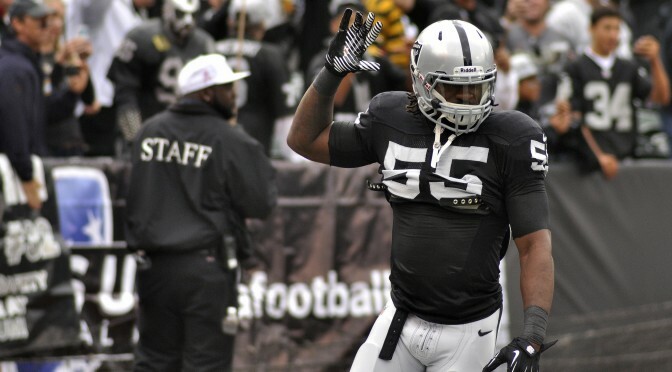 Twenty current and former NFL players – including Raiders LB Sio Moore and Miles Burris and CB TJ Carrie – will take part in the inaugural NFL Finance Camp March 17-20, 2015, at the University of Miami School of Business Administration. The program offers participants an opportunity to get an in-depth understanding of the people, investments and forces in the financial world that will dictate how well they can leverage their earnings into long-term financial security. Over the course of four days, the participants will receive instruction from University of Miami School of Business Administration professors, representatives from TD Ameritrade’s InvesTools education program and retired All-Pro defensive end Patrick Kerney, who now serves as the NFL Vice President of Player Benefits. NFL Player Engagement offers current and former players 8 training programs for post-NFL careers. The NFL Finance Camp will also include players’ wives and significant others, as well as KALEB THORNHILL, the Dolphins’ Director of Player Engagement. Visit the NFL Player Engagement website (www.NFLPlayerEngagement.com) and the NFL Player Engagement Blog (www.NFLPE.sportsblog.com) for updates throughout the program.